We are very proud to announce that we have launched our Kickstarter Campaign for our NEW printed furniture range. Please click on the link below to view the campaign. We have collaborated with GENI Design Agency, which has enabled us to produce a unique range of prints and designs to bring a more contemporary feel to our furniture. Also we have added our children’s range which includes a choice of three overlays, which allows them to explore their creativity by colouring in and painting as much as they want to. Unlike other kids’ furniture (and your walls, clothes, and floors…) you can easily remove their masterpieces to replace with a new one. 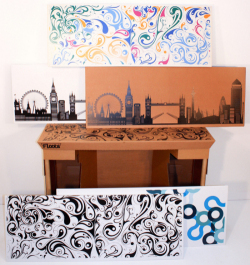 Cardboard Furniture – It’s finally here!